"UNDERTALE The path of Genocide"
Let me know what you think in the comments below, and hey, if you're new, favorite and watch my gallery!!! Dying, dying, yet more death. lol Great job on the texture and shadings though! 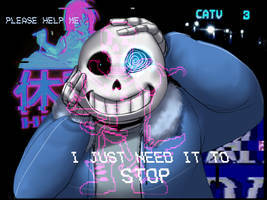 Good to see some UT fanart for the No Mercy run that has Frisk as the killer and not Chara. I would think that this is the slapstick version of the genocide route, in fact, let's put it this way, they all experience the same procedures like Wile E. Coyote. Matatton: Who need a body with legs like these?? And frisk so happy !!!! Thanks for adding humor to the genocide run! this is in the universe that when a monster dies, it doesn't turn to dust. nice, but shouldn't Frisk be Chara? I just mean, if this is the Genocide path, it should be Chara in the picture. But it's funny anyways! Great job! This is probably the cutest depiction of a genocide run I've seen.